Version 16.03 is now available for download. Thanks to a new team member, Chris, we have an all new site design! Not only is it responsive and mobile-friendly, but it also has a more modern, fresh design that is easier to navigate. It is also easier to maintain, has better server performance, and is served over HTTPS. We also have a new discussion forum. Lastly, here is more information about the new release. Among the many new features and fixes in the new FFmpeg 3.0 release, this version contains a much improved AAC audio encoder and a new Cineform HD decoder. Also, with this update, Shotcut provides proper conversions between Rec. 601 and Rec. 709 color spaces. Some of the renaming in Shotcut is intended to make things more expected and obvious. 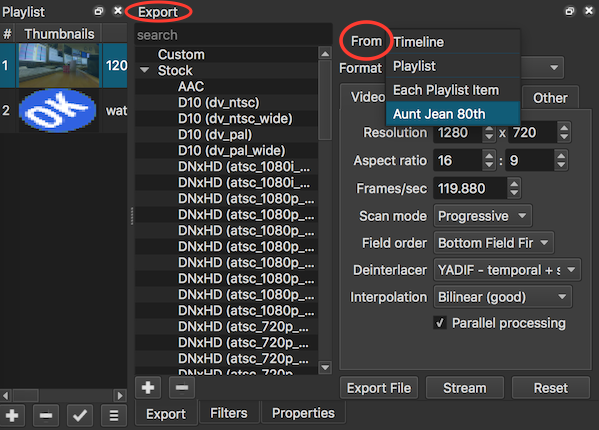 Most people, especially novices, are not acquainted with video switchers and the legacy editing systems that gave rise to the term “Program monitor.” Likewise, most people are looking for an Export function rather than “Encode.” In addition, you no longer need to save and close the project, fire up another instance of Shotcut, or use another app to transcode a file in the middle of working on a project. You can simply open a file and select the appropriate option from the From field at the top of the Export panel. Furthermore, if you want to batch encode a bunch of clips or shots to the same format, you can add them to the Playlist and choose Each Playlist Item.